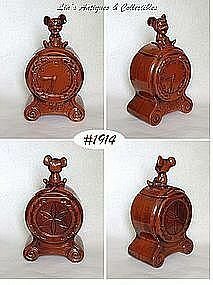 THIS IS A VERY CUTE MCCOY COOKIE JAR -- IT'S A CLOCK WITH A MOUSE SITTING ON THE LID. THE CLOCK HANDS INDICATE IT'S 8:35 AND BELOW THE CLOCK IS "TIME FOR COOKIES". THE MOUSE (HE IS THE LID'S HANDLE) HAS A COOKIE, WEARS A BIG OPEN-MOUTHED HAPPY GRIN, AND GLASSES. HE IS OFTEN REFERRED TO AS A "BEATNIK" MOUSE. JAR IS IN VERY GOOD SHAPE -- ONLY "USE" EVIDENCE ARE 4 TINY (1/16") DINGS ON UNDERSIDE OF LID RIM EDGE. APPARENTLY A PREVIOUS OWNER DIDN'T LIKE THE MATTE/BISQUE TYPE FINISH ON THIS JAR BECAUSE THEY CLEAR-COATED IT -- NOW HAS A SHINY GLAZE. NOT ESPECIALLY DISTURBING AND COULD PROBABLY BE REMOVED, I DIDN'T ATTEMPT. THIS IS A VERY NICE JAR BUT SINCE IT'S APPEARANCE HAS BEEN ALTERED, I HAVE ADJUSTED PRICE ACCORDINGLY.